During my interview trail in two places was I asked about an "interesting" case. As I sit back and think of that interview, I reminisce the day I was in the same shoes as you. 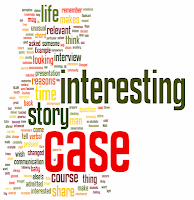 Then the question of "tell me an interesting case" comes up. Listed here are some reasons what makes a case interesting to share. Any of the above points are valid reasons as to why a story becomes interesting. Example: This is an interesting story to share. Applicant Matt B. indicated that there was one case in particular he remembers of a middle aged alcoholic who was brought in to the ER with altered consciousness. The balding disheveled patient was unkempt and painted a sorry picture of a man who had failed in life. The man was being ignored by the ancillary staff but this M4 student took up his case and treated him that night. He went on to disclose that his father was an ex-alcoholic and had fought with the addiction for a long time and knew what it meant to be in that state. This story is not unique but it was powerful narrative that was exceptionally relevant to this candidate. He impressed the PD. A story that influenced your or someone else's life is always an impressive and interesting case to share. An example would be if in case you worked at a free clinic or volunteered your time and effort in Africa or Latin america. You can share a story where you made a positive change in a community. Of course it does not have to be limited to these scenarios any thing that changed the course of your life or someone else's life will be a great "interesting" story. When we think of an interesting case, this is usually the first thing we think of. This is often the easiest to come up with at the same time it also has a danger of being glossed over by the interviewer. Think of the zebras that you may have come across and jot down the case mentally before the interview in case you are asked about it. One thing to be careful is that do not make up a case, as you wont seem sincere and never narrate a case that was discussed in a journal (emedicine, webmd, NEJM). This will present you in very poor light and you can certainly wish your residency chances at that institution good bye. In this case they are not interested in the case per say but interested in how you deliver it. This is the test of interpersonal communication and they are looking for verbal cues that will affirm the notion that you are effective communicator. Hope the above examples expand your perception of what makes an interesting case 'interesting' and help you prepare a cogent case for discussion. Also dont forget to read about 16 things to consider before an interview day. Is it just like telling them a simple story of what happened or a proper case presentation like what was in the history, vitals, examination, investigations etc etc? It can be a simple story but has to be delivered in a personal, impressive way. You could do a rote proper presentation and still not make that much of an impact while a story that has relevance to you and the audience makes it much more interesting. You will be able to gauge what the interviewer wants from you during the course of conversation. Overall be honest about your 'case'. Good luck!